$13.50 Out of stock. Email me when new stock arrives. Want to change a kid helper into rabbit? Here's a Torn and Restored Paper Hat routine that does the trick. Instead of a bonnet or dunce cap, this hat looks like a pair of pink and white rabbit ears! Ra El Mago and Julio Abreu have taken a classic routine and updated it for magicians and kid audiences. Watch the video to see how you can add some bits of business to create a routine that'll last over 4 minutes, get loads of laughs, really surprise your audience and let you make a rabbit-ear, magic hat souvenir for a deserving kid helper. The routine is based on the classic Hat Tear effect. You take two pieces of white and pink tissue paper, tear them into small pieces and crumple them into a small paper ball. When you unfold the pieces, they restore back together again, transforming themselves into a Rabbit-ear Paper Hat! When you give the hat to your volunteer, you'll create a memory that will last a long, long time. In each bundle, you’ll get enough specially prepared tissue paper packets to perform the routine ten times. Use the creators’ routine in the video, or make up your own. 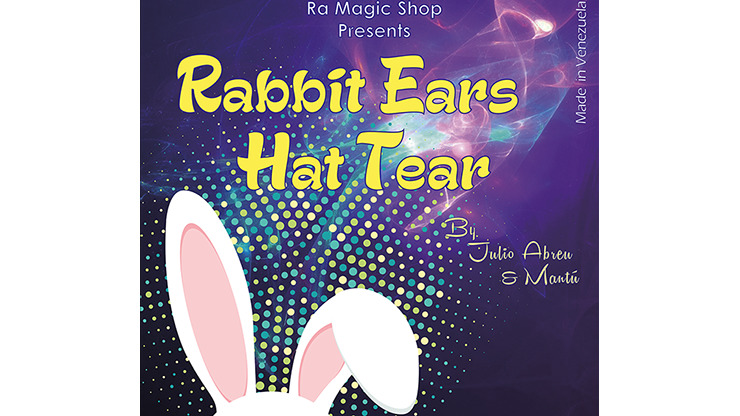 Either way, you’ll be thrilled with impact you make on family and children’s audiences when you perform the Rabbit Ears Hat Tear.